Wood veneer edge banding allows you to make raw plywood look like beautiful, solid wood. 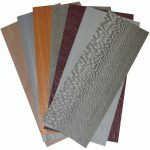 Here at Sauers & Company Veneers, we have many options when it comes to wood veneer edge banding, so you are sure to find a product that works for your needs. We have many different types of species available, as well as several backing options to choose from. One of our most popular backing options is iron-on, because it is quick and easy to use. You can even use your household iron to attach this wood veneer edge backing, but there is a chance you’ll get some adhesive on it, so it may be a good idea to purchase a cheap iron at a thrift store or elsewhere to keep in your workshop. Get your plywood ready. Sand the edge smooth and then vacuum all the sawdust. Cut your wood veneer edge banding to approximate length, aiming to leave about a half-inch of extra banding on each end (you’ll cut this off later). Center the banding and move along the edge from one end to the other with the iron. Move the iron about 2 inches per second and press the banding firmly with a wood block while it is still hot. Once you’re done, trim each end with your utility knife. Use the special trimming tool to trim both edges. Sand the edges lightly and you are done. Our full line of wood veneers and accessories at Sauers & Company Veneers makes it easy to achieve your desired results during any woodworking or hobby project. Contact us today!